Thule/Konig is one of the most respected names in the automotive industry. They are famous for their world leading ranges of car roof racks and bike racks etc; and now firmly placed as one of the major players in the snow chain market. 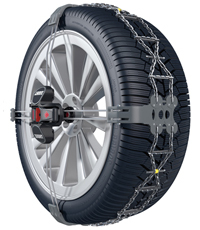 The Thule/Konig range of snow chains includes the innovative K-Summit models, which fits over the top of the tyre with no contact at all behind the tyre or wheel rim. This model is available in most car, SUV & 4x4 sizes. Another superb Thule/Konig model is the new super slim CK7 that has a maximum projection over the tread and behind the wheel of only 7 mm. Both of these snow chain will vehicles with minimal wheel clearances, where previously it would have been impossible.